A legend grew up that Bishop Simpson was a major advocate for emancipation in 1862. 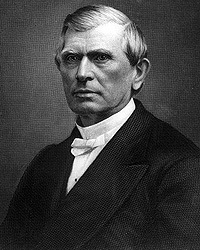 Although anti-slavery, Bishop Simpson was usually a cautious moderate on most things religious or political. 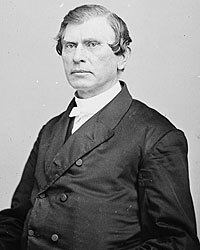 And in the summer of 1862, Bishop Simpson was on an extended trip to the West Coast and did not arrive back in Washington until October – after the draft Emancipation Proclamation had been issued. Robert D. Clark, The Life of Matthew Simpson, p. 218. George Richard Crooks, The Life of Bishop Matthew Simpson of the Methodist Episcopal Church, p. 371-372. Edgar DeWitt Jones, Lincoln and the Preachers, p. 56-57. Michael Burlingame, editor, William O. Stoddard, Inside the White House in War Times: Memoirs and Reports of Lincoln’s Secretary, Sketch 8, p. 177. George Richard Crooks, The Life of Bishop Matthew Simpson of the Methodist Episcopal Church, p. 383. George Richard Crooks, The Life of Bishop Matthew Simpson of the Methodist Episcopal Church, p. 374-375. Robert D. Clark, The Life of Matthew Simpson, p. 236. Frank Abial Flower, Edwin McMasters Stanton: The Autocrat of Rebellion, Emancipation, and Reconstruction, p. 372. Elizabeth Todd Grimsley, “Six Months in the White House”, Journal of the Illinois State Historical Society, Vol. 19 (Oct.-Jan., 1926-27), p. 60. George Richard Crooks, The Life of Bishop Matthew Simpson of the Methodist Episcopal Church, p. 372-373. Robert D. Clark, The Life of Matthew Simpson, p. 244. Frank Abial Flower, Edwin McMasters Stanton: The Autocrat of Rebellion, Emancipation, and Reconstruction, p. 374. George Richard Crooks, The Life of Bishop Matthew Simpson of the Methodist Episcopal Church, p. 391. George Richard Crooks, The Life of Bishop Matthew Simpson of the Methodist Episcopal Church, p. 401.